I have been a Visual FoxPro programmer for many years, and new to Xojo and impressed with the product. We're looking to migrate our VFP projects to Xojo over the next few years...a massive undertaking. Question about drawing and canvases. I desire to create a simple area on a window to capture a signature on a Windows touchscreen device (i.e. Surface Tablet), or perhaps down the road on an iOS device. Can someone tell me how to accomplish this? 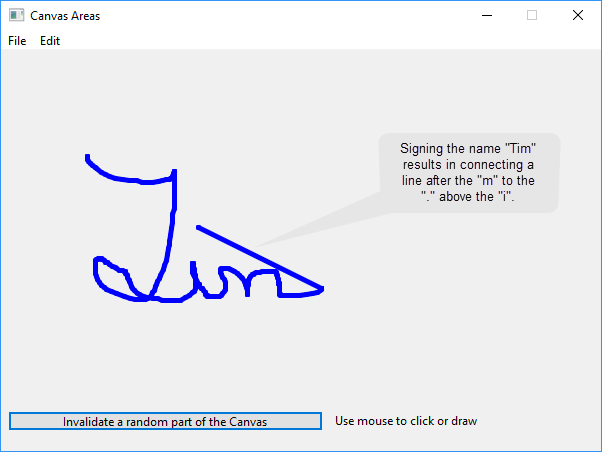 I saw that MBS has a web plugin, but I want someone to be able to draw their signature on a Windows device, in a desktop app. The ACCEPT button transfers the signature to a PICTURE image (imageSignature) so it can be used else where. The image is cropped to the minimum size for the signature to fit. It uses a modified version of what Jeff posted. Take a look at File>New Project>Examples>Graphics and Multimedia>CanvasAreas and see if it helps? · Aaron S likes this. If you go to https://imgbb.com/ then drop the image there, change the drop down to BBLinked then post the code here, it should work. I just looked at that code.... and must say... it is terrible for this type of situation. · Julian S and Aaron S like this. Dave - thank you so much! Just one minor issue...maybe has to do with being on the Windows platform. While I'm drawing, nothing appears until I let go of the mouse button. Very smooth lines, but I can't see what I'm drawing until I let go of the mouse. try replacing INVALIDATE with REFRESH and see it that works.... INVALIDATE is prefered (and works on macOS)... but WIndows may wait until other events are cleared first. Dave - you are amazing! How long did it take you to become this proficient in Xojo? I'm obviously in the learning phase and came from the world of FoxPro where I feel quite comfortable confident in my programming skills. Will you be at DevCon in Miami? There is just ONE more "quirk" with the code. 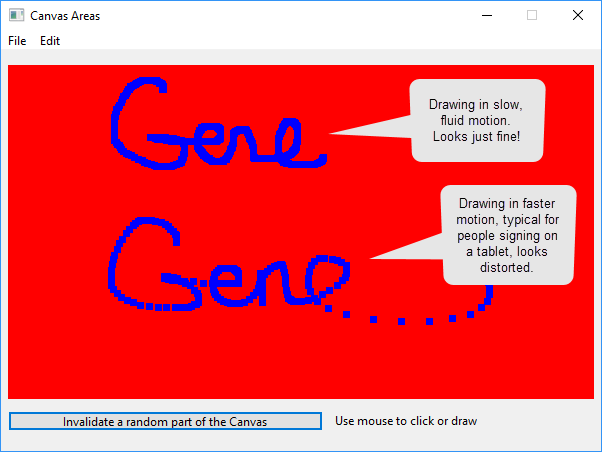 When you release the mouse button and go somewhere else on the canvas to draw, a connecting line is made between the two drawings. Is there a way to circumvent this behaviour? I genuinely appreciate your guidance on this issue. @Aaron S Dave - you are amazing! How long did it take you to become this proficient in Xojo? I'm obviously in the learning phase and came from the world of FoxPro where I feel quite comfortable confident in my programming skills. Will you be at DevCon in Miami? You need to notice that the mouse has been lifted in the MOUSEUP event. That suggests an array or a dictionary of Points() arrays. Not a NEW set of points, that would cause the first part of the signature to vanish. Dave, Jeff, and Julian - thank you for your help! I'm grateful, as this will now help me create a signature area on a window with a content form. Ultimately, I'll need to assemble this consent form with the signature graphic and produce a PDF. This feature will also be very useful for a number of my other database projects. Dave, I'm very interested to see your demo! · Steve K and Aaron S like this. Dave - I love it! This works perfectly. I just purchased your gPDF class so I can pull all of this together. Thanks again. I'm sure many other developers will benefit from this solution. Maybe you should refine and sell this signature pad, make it work on iOS and web, etc.